"An unprecedented cinematic journey ten years in the making and spanning the entire Marvel Cinematic Universe, Marvel Studios’ Avengers: Infinity War brings to the screen the ultimate, deadliest showdown of all time. As the Avengers and their allies have continued to protect the world from threats too large for any one hero to handle, a new danger has emerged from the cosmic shadows: Thanos. A despot of intergalactic infamy, his goal is to collect all six Infinity Stones, artifacts of unimaginable power, and use them to inflict his twisted will on all of reality. Everything the Avengers have fought for has led up to this moment – the fate of Earth and existence itself has never been more uncertain." 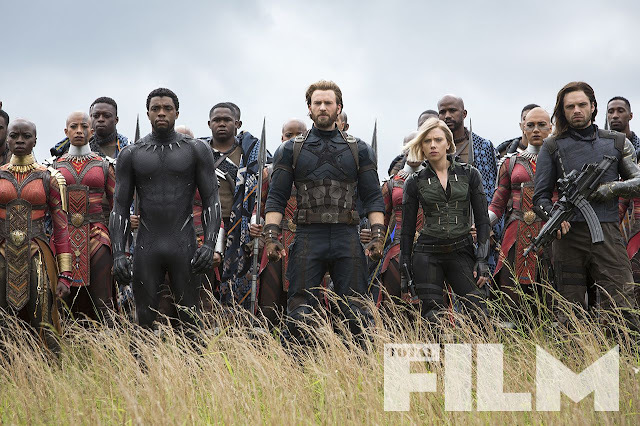 Pelakon-pelakon yang telah disahkan muncul dalam filem ini adalah Robert Downey Jr., Chris Evans, Mark Ruffalo, Scarlett Johansson, Chris Hemsworth, Tom Hiddleston, Anthony Mackie, Paul Bettany, Elizabeth Olson, Jeremy Renner, Chadwick Boseman, Sebastian Stan, Don Cheadle, Chris Pratt, Dave Bautista, Zoe Saldana, Pom Klementieff, Benedict Cumberbatch, Benedict Wong, Sean Gunn, Tom Holland, Paul Rudd, dan Josh Brolin. Anthony dan Joe Russo akan mengarahkan filem ini, dengan Kevin Feige. Louis D’Esposito, Victoria Alonso dan Michael Grillo sebagai penerbit. Stan Lee pula bertindak sebagai penerbit eksekutif. Anthony dan Joe Russo mengarahkan filem Avengers: Infinity War yang telah dijadualkan untuk tayangan pada 27 April 2018. Seterusnya, filem sambungannya yang masih belum diberi tajuk akan menyusul pada 3 Mei 2019.